In my work writing for Babyology, I sometimes come across the kind of product that is really and truly innovative. Something that makes me think, “This product is so good, it’s almost worth having another baby just so I can try it out”. 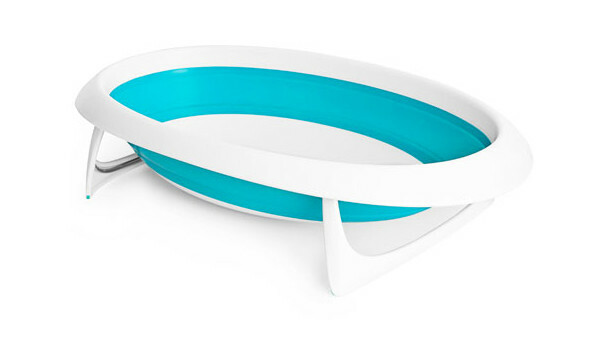 This baby bathtub from Boon is just such a product. Here’s a confession: I never enjoyed bathing my babies. I always made my husband do it. Our baby bath was an enormous, heavy plastic contraption which took up heaps of space, required me to bend in all sorts of uncomfortable positions to manoeuvre the child within it, and was impossible to move when full. I wish I’d had something like the new Naked 2-Position Collapsible bathtub from Boon. Available in lots of different bright colours, this bathtub is amazing because of its unique collapsible design. Not only does that mean it can be virtually flattened to hang up and store, but you can also set the bath up into two different positions depending on your baby’s age and size. Bathing a newborn? By flattening and lifting one end of the bathtub, you create a comfortable reclining position for the baby which makes it easier for you to safely bathe them, without mucking about with bath seats and inserts. Once your baby is a bit older, simply expand the bath fully to create a larger space for play. The video below gives a good idea of how the Naked bathtub works. You can pick up the Boon Naked bathtub at Urban Baby for $79.95. Check out our past posts for other great products from Boon.